Simmering in a cauldron deep inside the rainforest, a mixture of sugar, spice and everything nice gave birth to the Acid Amazonians. They forge their weapons from tangy apple rings, glitter and moonlight. 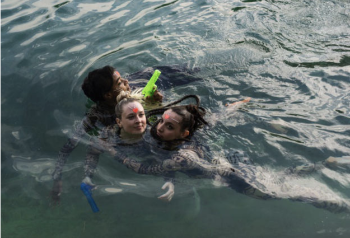 Armed with synthesizers and electric guitars as their bow and arrow, Rada, Franziska and Nina improvise live, blending their music with experimental videos, dance numbers, slogans and rap fragments on a common theme of super heroines, glitter and girliness in the digital age. Thus the three amazons march into battle against the evil creature normativity – rolling their superpowers of music, video and dance into a very, very magical fireball. And since, like all true villains, the monster is persistent, the Acid Amazonians keep attacking with improvised soundwaves, choreographies and slogans.